For organizations that want to get serious about introducing YaSM and service management best practice, we offer a set of ready-to-use process diagrams and document templates - a process model referred to as the "YaSM® Process Map". For each service management process, the process model describes in the form of a diagram the activities to be performed, the required inputs and the resulting outputs. Watch a video with Stefan Kempter introducing the YaSM Process Map (11:18 min). The graphical and navigable representation of the processes makes it easy to understand the YaSM processes and their interrelationships. 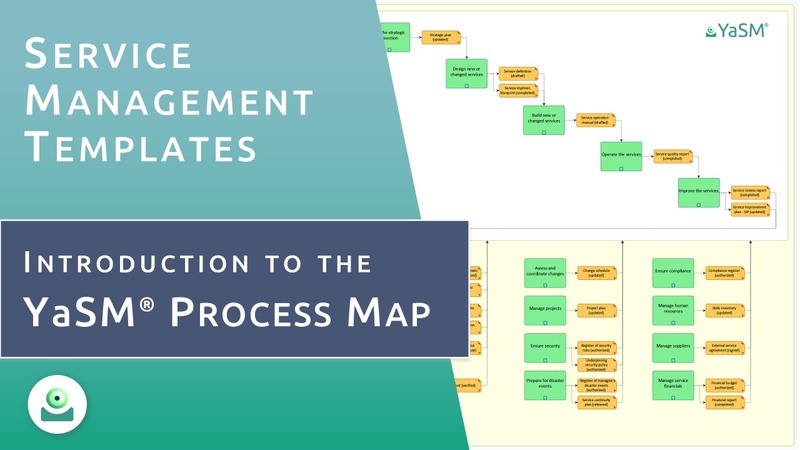 The YaSM Process Map is thus a very cost-efficient way of giving everyone in your organization a good understanding of service management best practice. What is more, introducing best practice in your organization typically means designing and documenting improved processes. To help you with this task, the diagrams and document templates of the YaSM Process Map can be tailored to your needs. You can simply modify existing content instead of starting with a blank page - which saves an enormous amount of time and effort. The top-level process diagram presents a high-level overview of the YaSM service management processes. 19 overview diagrams on detail level 2 show for each YaSM main process how it is related to the other processes and what sub-processes it contains. On detail level 3, 105 flowchart diagrams provide a detailed account of the process activities. 95 checklists or document templates in Microsoft Word™ format describe the typical contents of the various documents, policies and records produced in the YaSM processes. For more detailed information and examples of the diagrams and documents included in the YaSM Process Map, please refer to the platform-specific pages about the YaSM Process Map for Visio and the YaSM Process Map for ARIS. The YaSM Process Map is currently available in English or German for Microsoft Visio® and the ARIS Process Platform™. All process diagrams and documents are completely editable and can be adapted to the needs of particular organizations. License holders are entitled to maintenance and support services such as product updates, help with questions on YaSM in general and technical product support. The YaSM - ISO 20000 Bridge.